The Booklovers Library was an early 20th century version of Netflix for books. 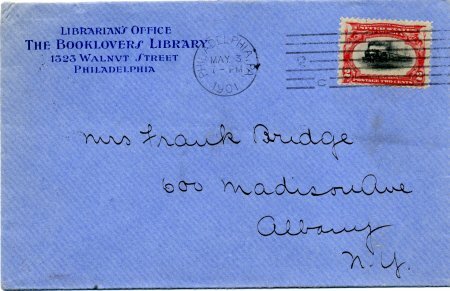 This cover was mailed from the Librarian's Office of the Booklovers Library on May 3, 1901. In an article on the topic of home delivery of books published in The Library Journal of 1905, Gertrude E. Forrest wrote, " The experiment of house to house delivery has been made by several libraries with varying results. At the head of this list, rated by the number of books delivered stands the Booklovers" Library, with its circulation per year of several million volumes. This library is, however, a purely business enterprise and its work is not comparable with the work done by free public libraries." This statement substantiates the claim by the Booklovers Library's founder Seymour Eaton that the library was, "The Largest Circulating Library in the World". Eaton who was a promoter of the first order also described the library as "The most unique library system in the World" and as "The most attractive book service in the world". 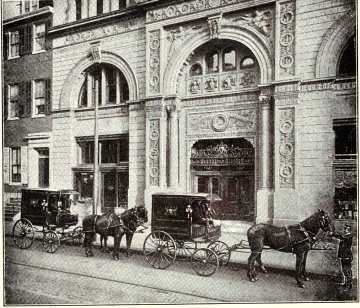 Picture showing book delivery wagons in front of the Booklovers Library's headquarters in Philadelphia from a 1901 promotional circular for the library. 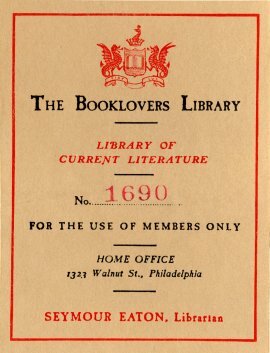 The first Booklovers Library was opened in Philadelphia on March 5,1900. By December 1, 1901, Eaton claimed that there were fifty branch libraries in major cities across the country and that book deliveries were being "made in practically every city and town of 1,000 population or over in the United States." The Booklovers Library was a membership library and a stock corporation and Eaton marketed both aspects with great effectiveness. Bookplate from one of the thousands of books in the Booklovers Library. Eaton also established the Tabard Inn Library which was targeted at a broader audience. He developed and promoted a variety of spin off enterprises related to the Booklovers and Tabard Inn libraries. Unfortunately, the revenue generated by these collective enterprises wasn't sufficient to sustain them and in 1905 he declared bankruptcy.